Note : Your request will be directed to Mobile Mark. 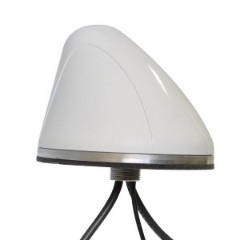 The SMW-312 from Mobile Mark is a 3-port Cellular/LTE, WiFi & GPS antenna. It has 3 antenna elements in a single radome, measuring 107 mm x 81 mm. One antenna element operates from 695 MHz to 6000 MHz covering 4G LTE at 700 MHz, 850 & 1900 GSM/CDMA bands, 1.7 & 2.1 AWS bands, as well as XLTE, LTE-A, Spark, and WiMAX 2.5. The second element can be used for WiFi at 2.4 & 5 GHz or it can be used for other wireless applications such as Public Safety at 4.9 GHz or DSRC at 5.9 GHz. The third element is for GPS applications in the 1575 MHz band, it has an integrated LNA which provides a gain of 26 dB. It has 3-cables to connect to each of the individual devices. This rugged antenna can be mounted to any vehicle, cargo container or trailer and is available in either surface mount or mag mount options.